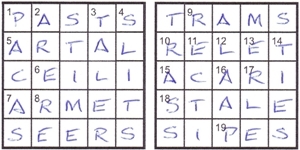 This week, what looked like a fairly interesting set of just 22 clues. Where there was a single algebraic expression, the answer was its square; where there were three expressions, the first was the sum of the squares of the other two and was the answer. Each letter was less than a hundred and the sum of two different non-zero squares. As I’ve said before, there is normally just one starting point for a mathematical puzzle. Here, it was unlikely to be a clue like 13dn AD + oo, A + C + e – W, O + t – M – T (4) but more likely to be 12ac (which had two clues) D/P (2) and A (3) or 16ac I (2). It would have probably been easier just to list out the distinct 28 values, but the table did just fine. Starting with 12, where the first two digits and the whole number were squares, that had to be 169, 256 or 361, with A = 13, 16 or 19. However, only 13 was the sum of two squares (or SOTS as I put in my notes), so one down and 21 to go. It was fairly near the beginning of the whole process that I remembered a numerical (Arden’s Square-bashing back in 2010, I think) where the correct solution depended on realising that the square root of a number can be positive or negative. I wondered if this would happen here. I then seem to forget all about that until I solved 2dn A + t – N (3) which was 13 + 68 – 97 giving -16. A short while later, I got to the end of the puzzle anyway so no real negative square issues. Except, I had both E and a equal to 53! Luckily, I didn’t have to go right back to the beginning, and found 13 Y, R – C, E – C – P (2) to be the culprit. Changing E from 53 to 37 fixed the problem and I breathed a sigh of relief. Mind you, the bottom half of each grid looked a bit sparse and presumably the letters in numerical order would help resolve it: they spelt out ILAPCREMSTVarytWoDOZeN. At first I wondered if I’d got the first bit wrong and it should be ELAP…. This could be split more clearly into the three parts required by the preamble: ILAPCREMST for the letters 0–9; Vary — what needed doing to the letters in the first grid to give the second; and Two Dozen giving the total number of 5-letter words in the final grids, which I assumed would be across, down and diagonal, excluding upwards and backwards. A short while later, after a bit of letter-matching and shuffling, I ended with the required number of words. Some were a bit weird and needed checking in Chambers, especially CEILI, ARERE and TRASS. About par on the stopwatch for a mathematical for me, and rewarding to get to the end without too much back-tracking! Thanks, Elap. This entry was posted on 8 December 2017 at 4:00 pm	and is filed under Solving Blogs. Tagged: Elap, Word Squares. You can follow any responses to this entry through the RSS 2.0 feed. You can leave a response, or trackback from your own site.